I'm pretty beat. I've got some heavy stuff on my mind, which I'm not going to get into here on the blog in detail, because Internet. But the good news is, I've got tools to deal with my heavy stuff. I've been engaged in my mindful practice of Taoism for over 15 years now. It's not a magic solution that solves all problems, and leaves me floating in midair. Rather, it's a discipline, a practice. And it doesn't mean that I live in a state of perpetual bliss, either. Really, it's just the opposite. I don't particularly feel any one thing all the time. Rather I'm committed to stay and feel everything. Over the years I've been doing it, my understanding of that practice has grown and changed. But my fidelity to it has not. Today I'm focused on a key tool that's part of that practice, wu wei, the action of non-action. It's not laziness, or indolence. It's a kind of relaxing surrender. Think of how water is. When you pour it into a glass, it takes the shape of that glass. It surrenders to gravity and form. And yet water is among the most powerful things on the planet. Storms and floods can erase mankind from places. And nothing grows without water to help it along. But water's power comes from its quiet nature. True, raindrops can hollow out a canyon - but not all at once. Just over time. This is where wu wei comes to bear. I can make myself spun up and anxious and out of sorts over things - and it will not change them. What will change them is me, being present and moving through time, one second per second, into the future. I can obsess over how things were, or may yet be. But that's not real. 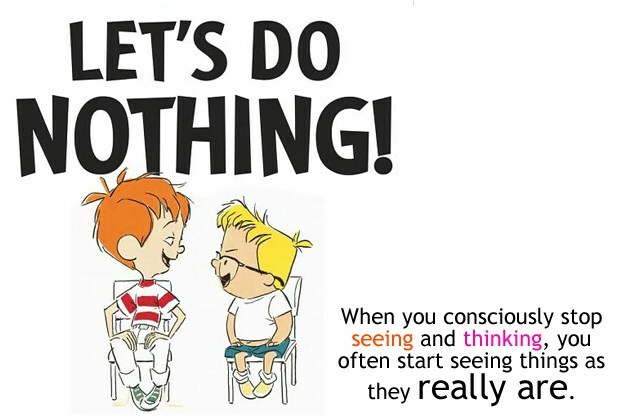 Instead, I can make the conscious choice to be present, and do nothing. Recently I got into a discussion with a friend about the difference between apathy and mindful detachment. "What the heck is the difference?" my friend asked. "What even is mindful detachment?" I spent some days thinking about it. Found a good way to tell them.